Are you like me and enjoy fresh onions on your food? I don’t know about you but cutting onions always made me cry, so I would avoid using them even when I love them. Well if that sounds like you, no worries! 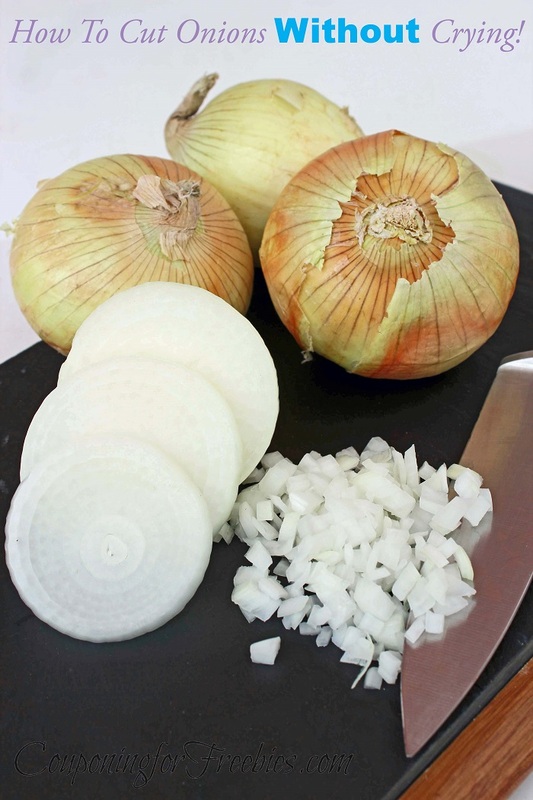 I have five tips to share with you on how to cut onions without crying! Some of these are a little outside the box too. This weeks Wednesday’s Weekly Savings Tips is on, saving your eyes, by learning how to cut onions without crying! Not sure what weekly tips are? You can read what they are about here. 1.) The one that I use the most to cut onions without crying, is to cut them under running water. I find it works best if it is hot water. No you don’t have to have the water running on the onion, you just need it near it. The onion vapors will be lifted up by the running water and will be kept away from your eyes. 2.) Then there is the method of freezing it. This one is easy to do, you just pop the onion in your freezer for about 15 minutes or so before you need to cut it. With the onion being so cold, it helps keep the onion from releasing the vapor that burns the eyes. 3.) Now this method will make the onions slightly milder in flavor, but soaking the onion before cutting helps a lot. Put the onion in a bowl of water. Make sure that it is fully covered. Soak it for about 15 min. then cut as you like. 4.) Now this one is really outside the box, but it works! Use a pair of goggles while you are cutting. There are ones made just for cutting onions, however the cheap plan swim goggles work just fine. You can find them in dollar stores or even on Amazon. Be sure to wash your hands after you are done cutting and before you remove the goggles. By doing so, you will keep the fumes out of your eyes completely. 5.) Using a well vented area will also help. So be sure to turn on your kitchen fan, place your onions underneath it. Then chop away. I have found that this one does help, but not as well as the others for me.